What do Fishermen go after on the High Seas? The high seas can be broken into 18 sections. 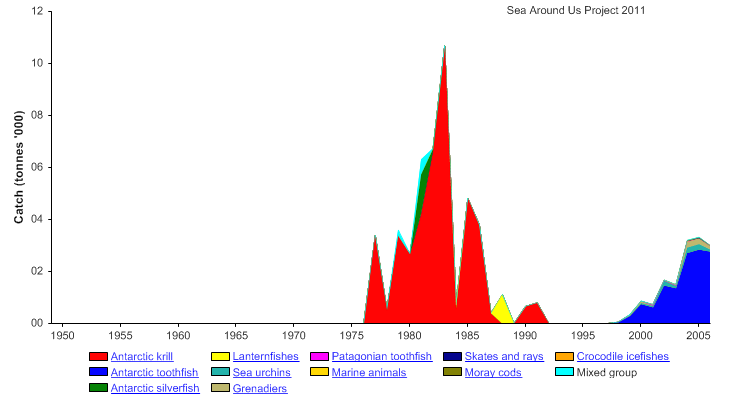 These areas tend to have different fish species that different countries go after. 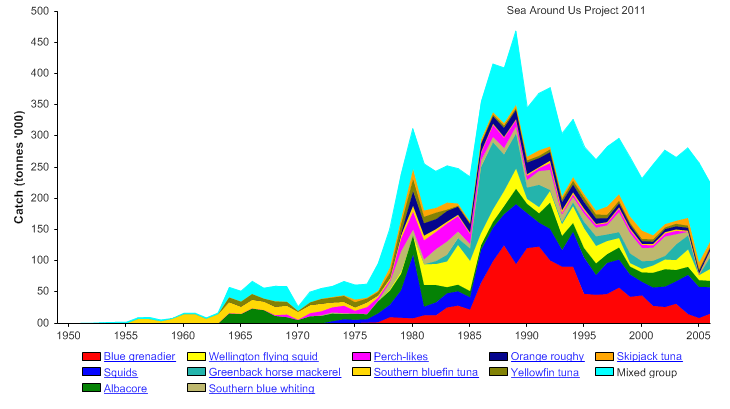 This section will briefly go through each of those 18 regions, showing graphs from the Sea Around Us project, and giving a brief summary of what is fished the most and who does the most fishing in those areas. 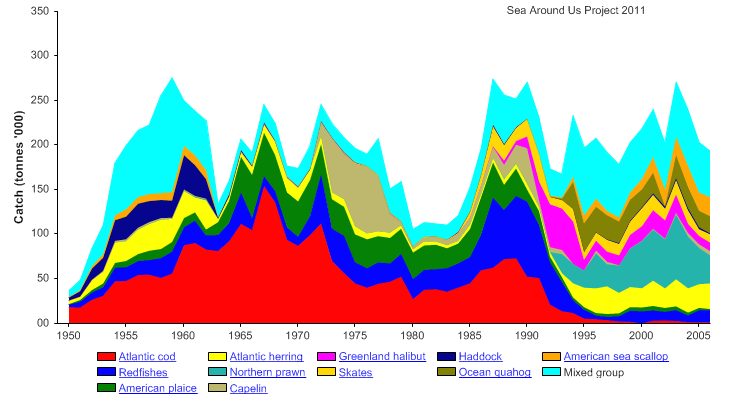 Except for the Arctic Sea the summaries do not include Mixed group fisheries and countries designated as "other". Mixed group organisms are composed of an assortment of creatures that are not fish or major invertebrates (such as crab or squid). Countries designated as "other" usually refers to a bunch small island nations. The latest data for these graphs come from 2006. 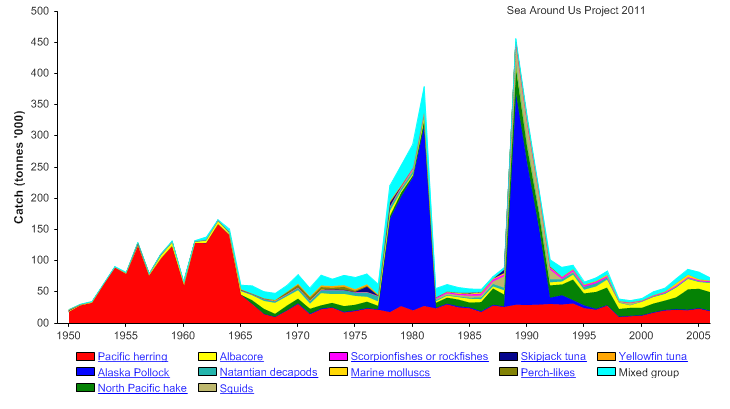 In the Arctic sea the main catch is a mixed group of organisms at about 66 tonnes in 2006. Mixed group catches are composed of a variety of organisms that are not fish or major crustaceans. 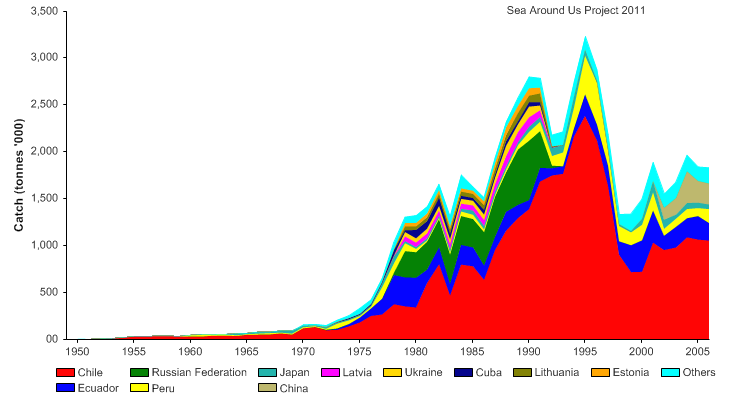 The country that fishes the most in the Arctic Sea is the Russian Federation, which pulled in 75 tonnes of catch in 2006. The biggest fishery in the Atlantic part of the Antarctic ocean is for Atlantic Krill, in 2006 105,945 tonnes of krill was fished out. 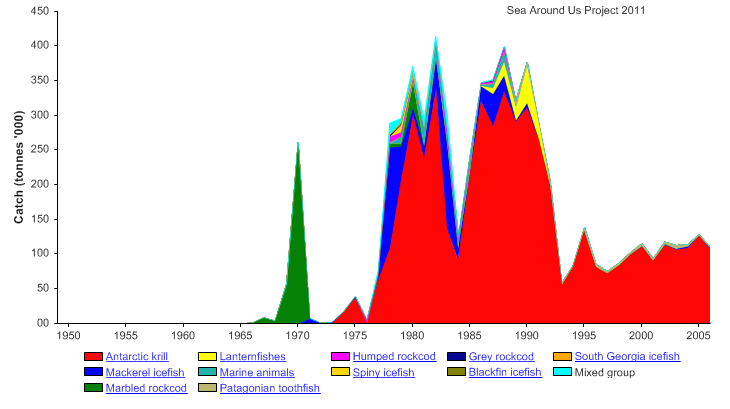 The next biggest fisheries where for the Patagonian toothfish and the Mackerel icefish, at 1869 tonnes and 1856 tonnes respectively in 2006. In 2006 the three countries that fished the most were South Korea (43903 tonnes), Japan (32886 tonnes), and the Ukraine (15252 tonnes). 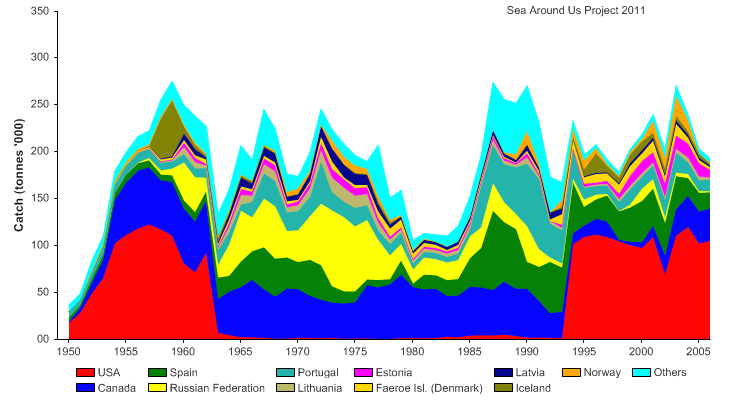 In the Eastern Central part of the Atlantic the three biggest fisheries are for three species of tuna, the Yellowfin (54291 tonnes), Skipjack (74817 tonnes), and Bigeye (38993 tonnes) in 2006. The three main countries fishing this region was Ghana (54640 tonnes), Spain (22426 tonnes), and Panama (25672 tonnes) in 2006. 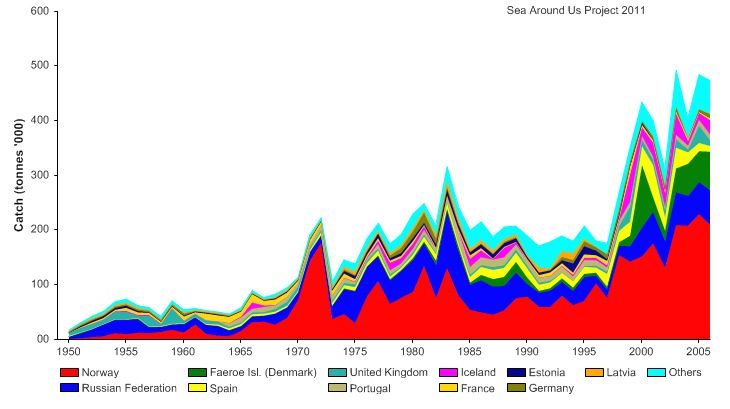 In this region in 2006, the top three fish that were taken were: Blue Whiting (420244 tonnes), Atlantic Herring (9097 tonnes), and Atlantic cod (7980 tonnes). The top three countries that fish in this region are Norway (208559 tonnes), the Fearoe Islands (71027 tonnes), and the Russian Federation (63977 tonnes). 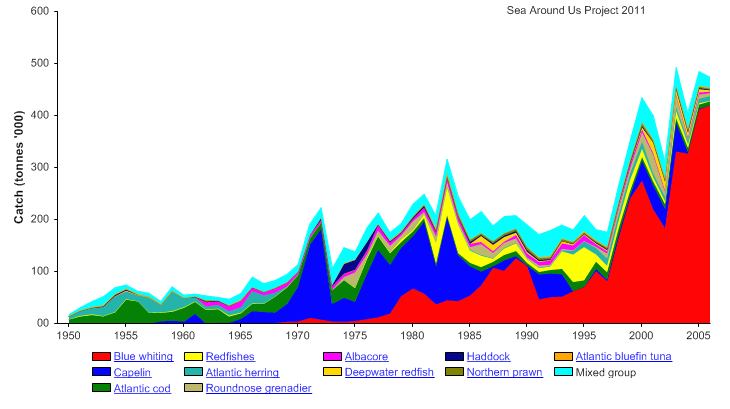 The top fisheries in the Northwest Atlantic in 2006 were for the Northern Prawn (30882 tonnes), Atlantic Herring (28833 tonnes), and the American Sea Scallop (21422 tonnes). 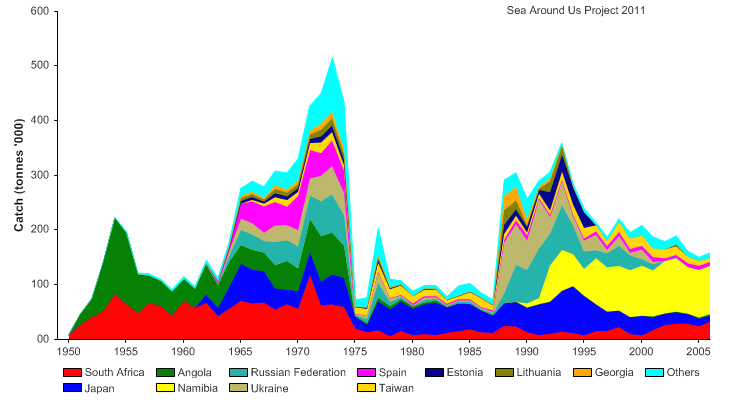 In 2006 the top three countries fishing this region were: The United States (105566 tonnes), Canada (34426 tonnes), and Spain (17093 tonnes). 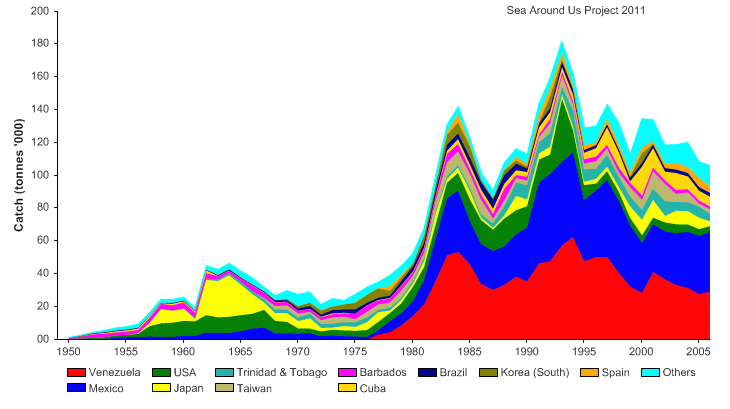 In the Southeast Atlantic, the three main fisheries in 2006 were for the Cape Horse Mackerel (94070 tonnes), Bigeye tuna (15083 tonnes), and for Albacore tuna (9613 tonnes). The three top countries fishing this region in 2006 were: Namibia (88778 tonnes), South Africa (33159 tonnes), and Japan (11548 tonnes). 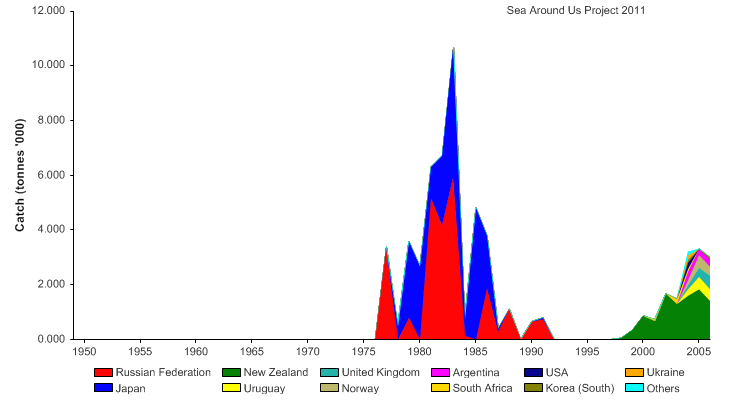 In the Southwest Atlantic, the three top fisheries in 2006 were for the Argentine Shortfin Squid (438586 tonnes), the Argentine Hake (49682 tonnes), and the Southern Blue Whiting (21503 tonnes). 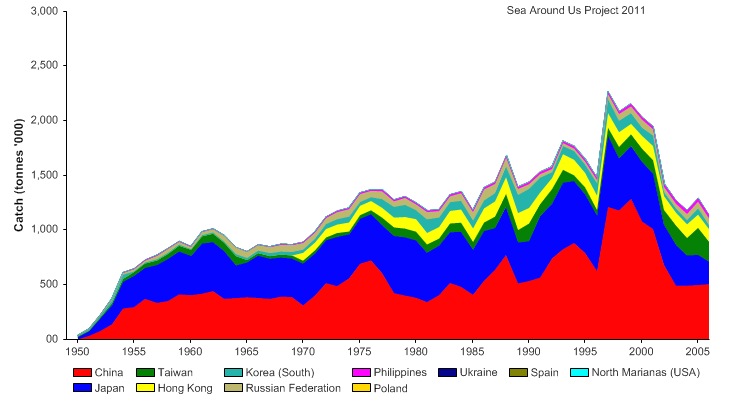 The three top countries fishing the Southwest Atlantic in 2006 were: South Korea (160248 tonnes), Taiwan (136041 tonnes), and China (105091 tonnes). 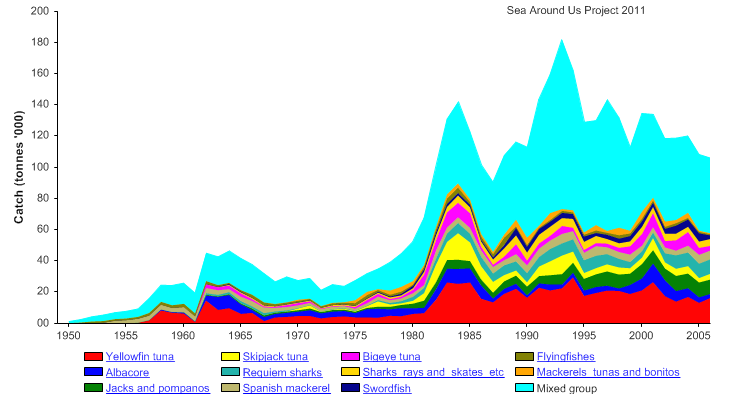 In the Western Central Atlantic, the three top fisheries in 2006 were for Yellowfin Tuna (16601 tonnes), Requiem Sharks (9298 tonnes), Jacks and Pompanos (9211 tonnes). 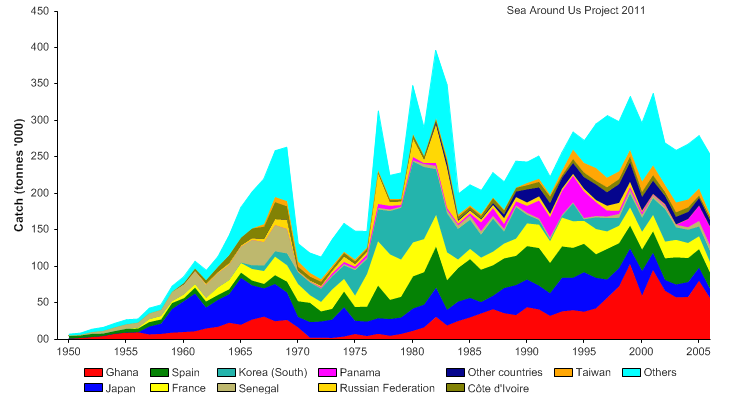 The top three countries fishing the Western Central Atlantic in 2006 were: Mexico (36308 tonnes), Venezuela (29530 tonnes), and Cuba (5857 tonnes). 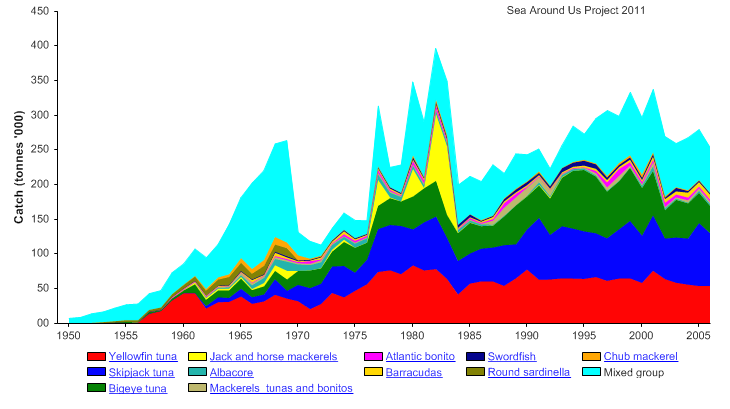 In the Antarctic Indian Ocean, the three top fisheries in 2006 were for the Antarctic toothfish (884 tonnes), the Patagonian toothfish (378 tonnes), and Marine animals (166 tonnes). 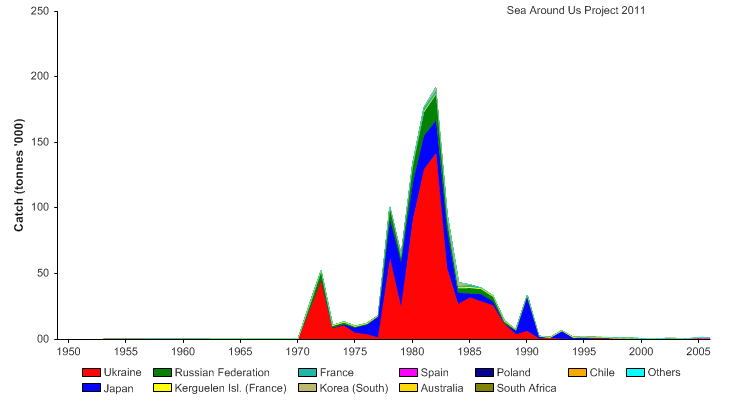 The top three countries that fished the Antarctic Indian Ocean in 2006 were: Spain (581 tonnes), South Korea (357 tonnes), and France (332 tonnes). 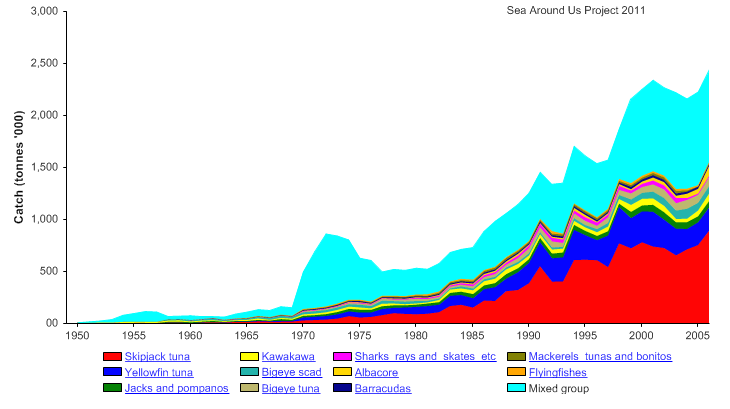 In the Eastern Indian Ocean, the three top fisheries in 2006 were for Skipjack tuna (73234 tonnes), Yellowfin tuna (44489 tonnes), and Skipjacks and Pompanos (34347 tonnes). 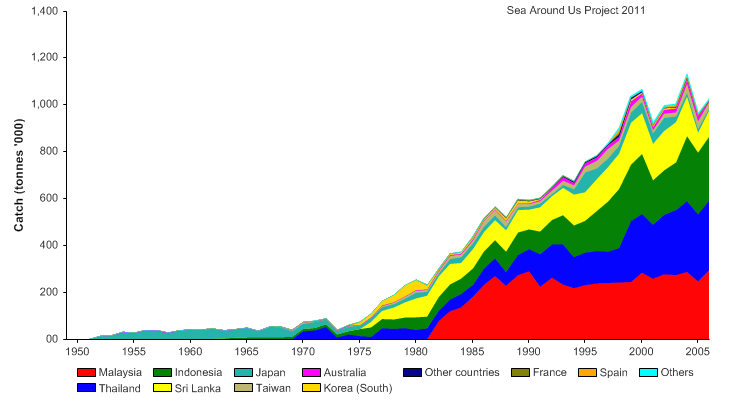 The top three countries that fished the Eastern Indian Ocean in 2006 were: Malaysia (300436 tonnes), Thailand (298204 tonnes), and Indonesia (273408 tonnes). 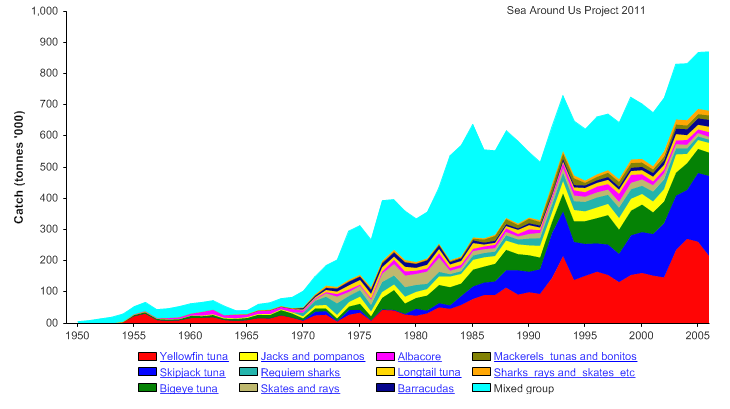 In the Western Indian Ocean, the three top fisheries in 2006 were for Skipjack tuna (260022 tonnes), Yellowfin tuna (212642 tonnes), and Bigeye tuna (74793 tonnes). 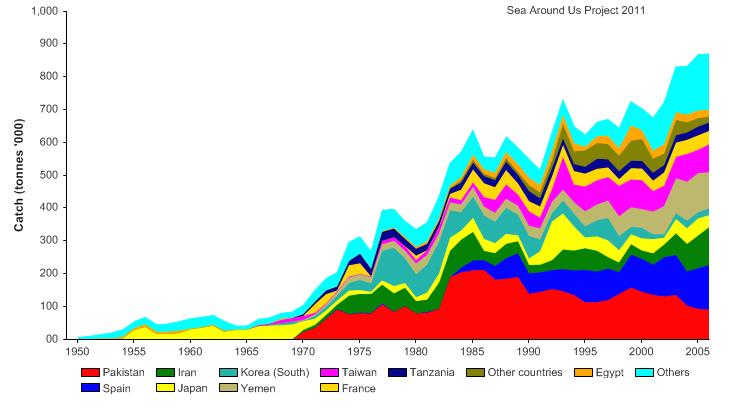 The top three countries that fished in the Western Indian Ocean in 2006 were: Spain (136642 tonnes), Iran (116596 tonnes), and Yemen (109573 tonnes). 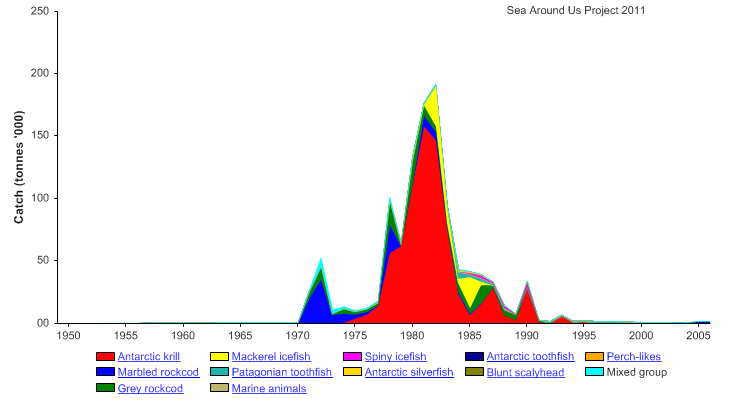 In the Antarctic Pacific, the three top fisheries in 2006 were for Antarctic toothfish (2766 tonnes), Grenadiers (120 tonnes), and Sea Urchins (70 tonnes). 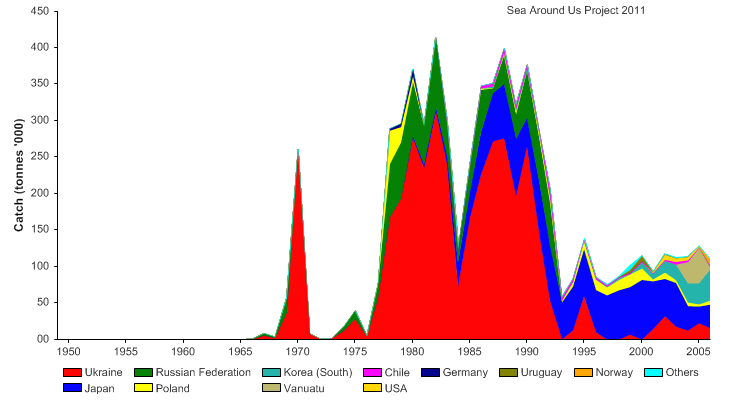 The top three countries that were fishing the Antarctic Pacific in 2006 were: New Zealand (1377 tonnes), United Kingdom (509 tonnes), and Uruguay (423 tonnes). 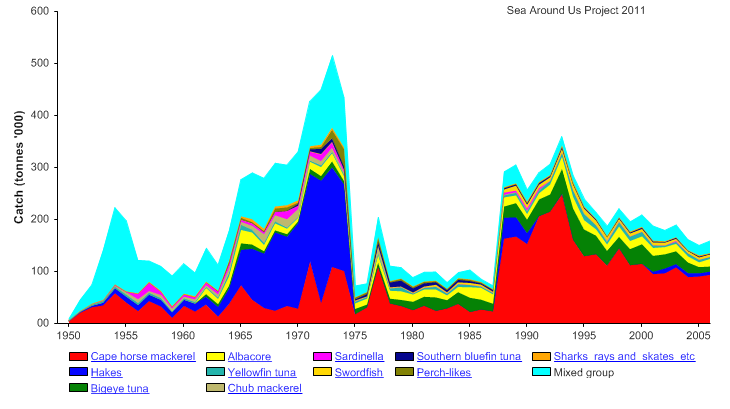 In the Eastern Central Pacific, the three top fisheries in 2006 were for Yellowfin tuna (211021 tonnes), Skipjack tuna (138184 tonnes), and Bigeye tuna (92234 tonnes). 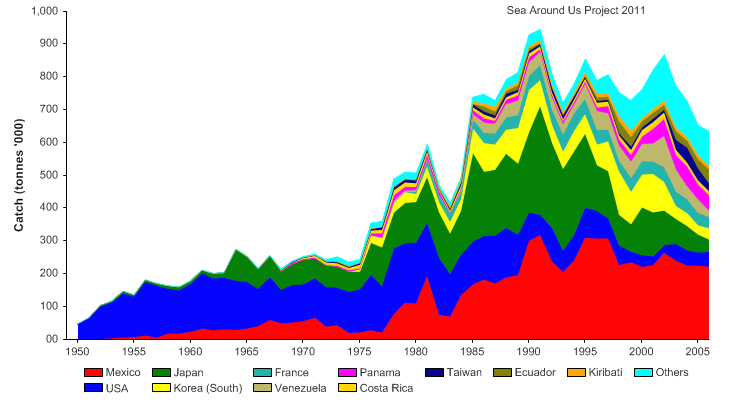 The top three countries that were fishing the Eastern Central Pacific in 2006 were: Mexico (222303 tonnes), Panama (47916 tonnes), and The United States (45547 tonnes). 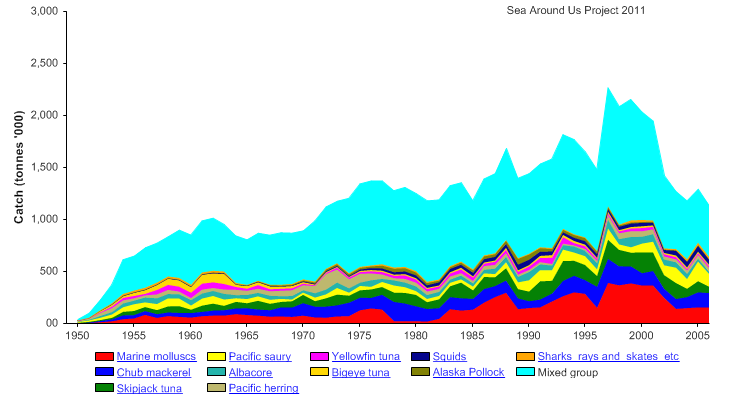 In the Northeast Pacific, the three top fisheries in 2006 were for North Pacific Hake (29677 tonnes), Pacific Herring (19602 tonnes), and Albacore tuna (14887 tonnes). 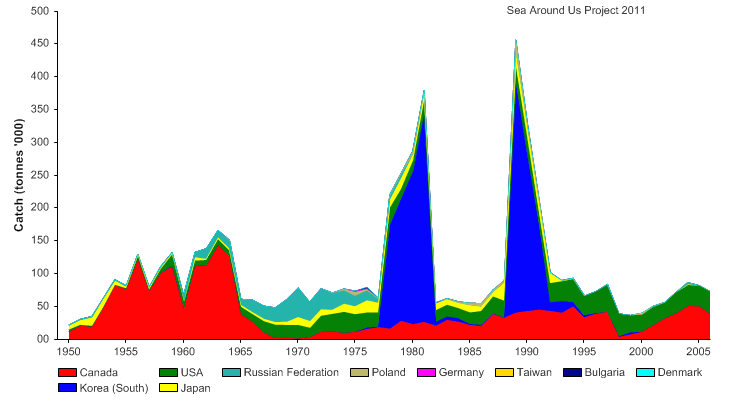 The top three countries that were fishing the Northeast Pacific in 2006 were: Canada (38730 tonnes), United States (34056 tonnes), and Japan (193 tonnes). 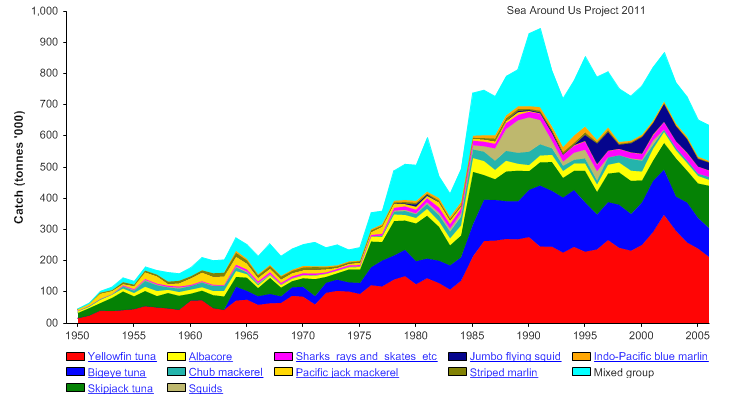 In the Northwest Pacific, the top three fisheries in 2006 were for Marine molluscs (155779 tonnes), Chub mackerel (137201 tonnes), and Pacific saury (116440 tonnes). 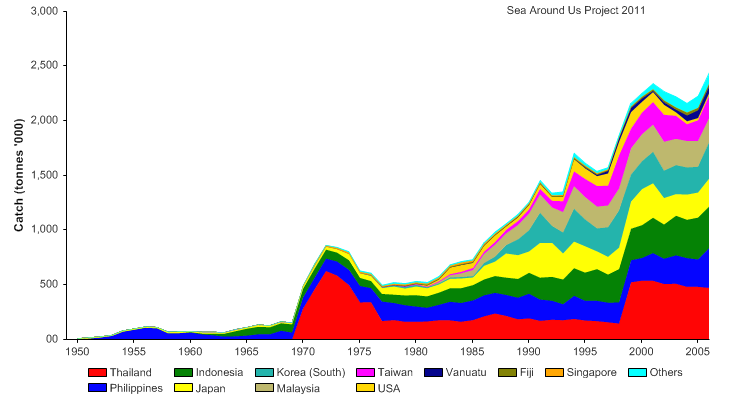 The top three countries that were fishing the Northwest Pacific in 2006 were: China (508637 tonnes), Japan (198475 tonnes), and Taiwan (176181 tonnes). 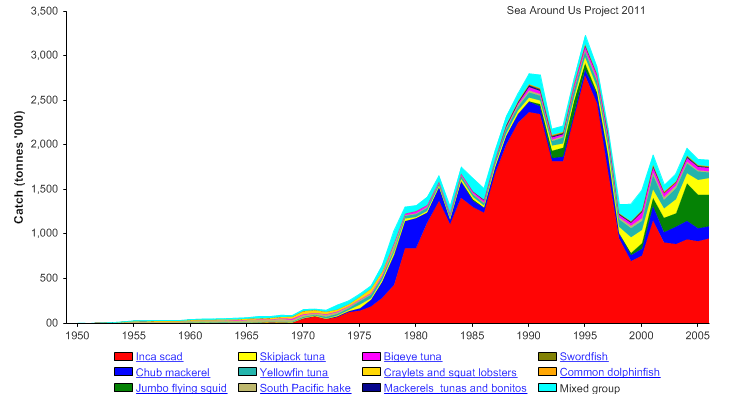 In the Southeast Pacific, the top three fisheries in 2006 were for Inca scad (957801 tonnes), Jumbo flying squid (352979 tonnes), and Skipjack tuna (187008 tonnes). 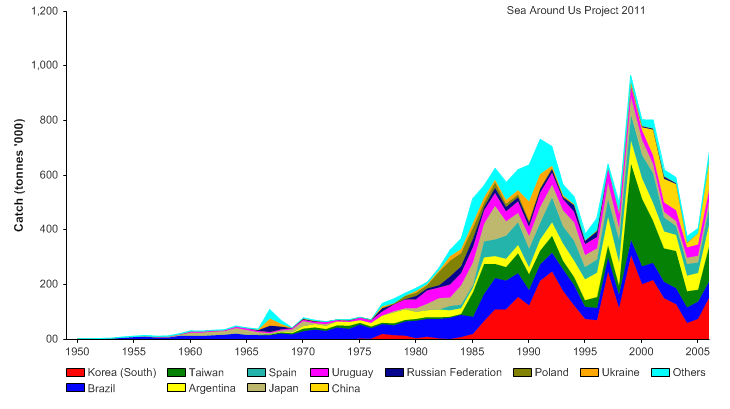 The top three countries that were fishing the Southeast Pacific in 2006 were: Chile (1055927 tonnes), China (222305 tonnes), and Ecuador (181527 tonnes). 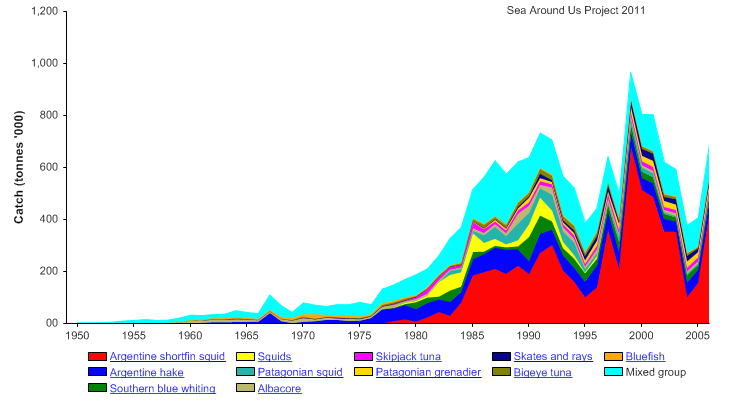 In the Southwest Pacific, the three top fisheries in 2006 were for Squids (42045 tonnes), Greenback horse mackerel (20628 tonnes), and Wellington flying squid (19921 tonnes). 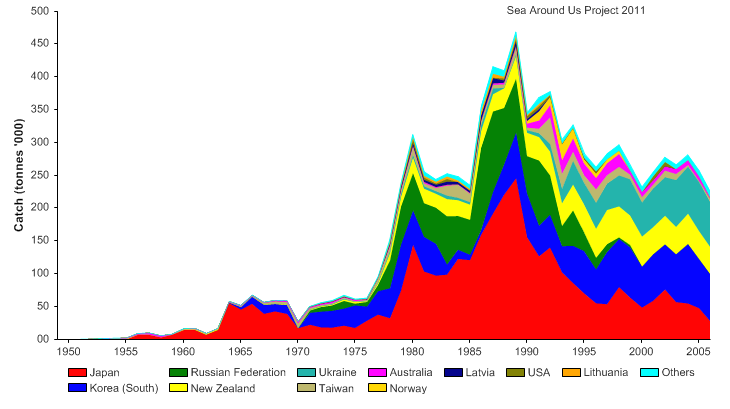 The top three countries that were fishing in the Southwest Pacific in 2006 were: South Korea (71642 tonnes), Ukraine (67966 tonnes), and New Zealand (41012 tonnes). 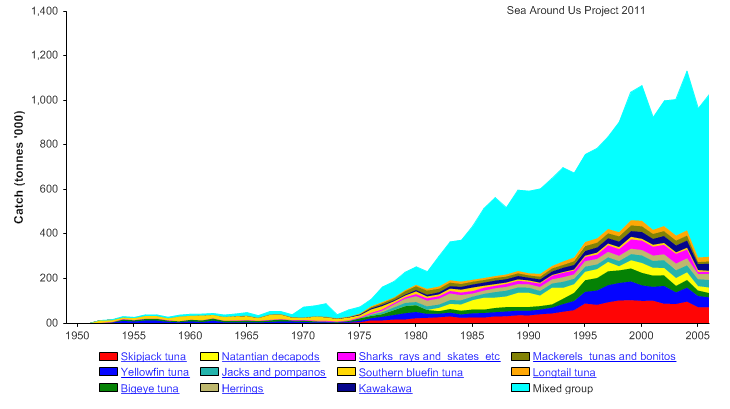 In the Western Central Pacific, the three top fisheries in 2006 were for Skipjack tuna (906164 tonnes), Yellowfin tuna (224198 tonnes), and Albacore tuna (99193 tonnes). The top three countries that were fishing in the Western Central Pacific were: Thailand (472278 tonnes), Indonesia (380535 tonnes), and the Philippines (373303 tonnes).